I just like making knitting cards. So I think most of you know that I have a twin sister. We do everything alike...but about a year ago, she started to knit. She found this awesome yarn store in Oklahoma...L&B Yarn and loves it! But for me knitting isn't fun nor relaxing I get so frustrated with the whole thing. So I decided to kinda play off on what I love (making cards) and what she loves (knitting)...mix well, bake for 45 mins at 350 and this is the end result: ta-daaaaa! 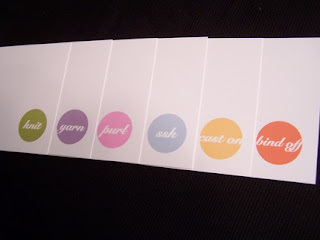 Awesome knitting cards! hehe! Visit my shop on Etsy to view my other knitting creations! Enjoy!